Not exactly a piano, definitely not a kid, but possibly a bike or a bike-like object here in River City. 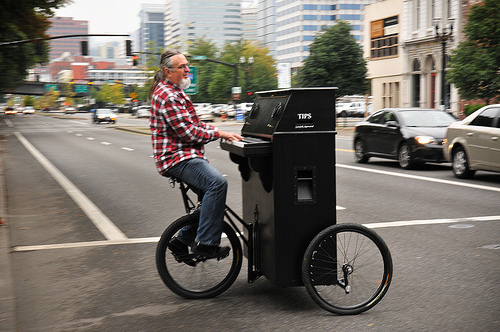 Dezy Walls has brought his singing and piano playing to the streets of Portland. You can read all about it here. Watch a video, listen to his songs, find out where you can next see and hear him here. You are currently reading The Piano Bike Kid at Piano Connections: The Studio of Megan Hughes.